In my last post bear cat blogger left me a comment saying that my outfit reminded her of the movie "Une Femme est Une Femme." I thought to myself, how have I never seen this? Thank goodness for Netflix. I looked it up and started watching or really read-watching because of the subtitles, but wasn't able to finish just yet (because I'm kind of a grandma and went to sleep at 7pm). This morning I couldn't get the opening scene out of my mind as Angela is walking through the streets, stopping in the shops, saying hello. 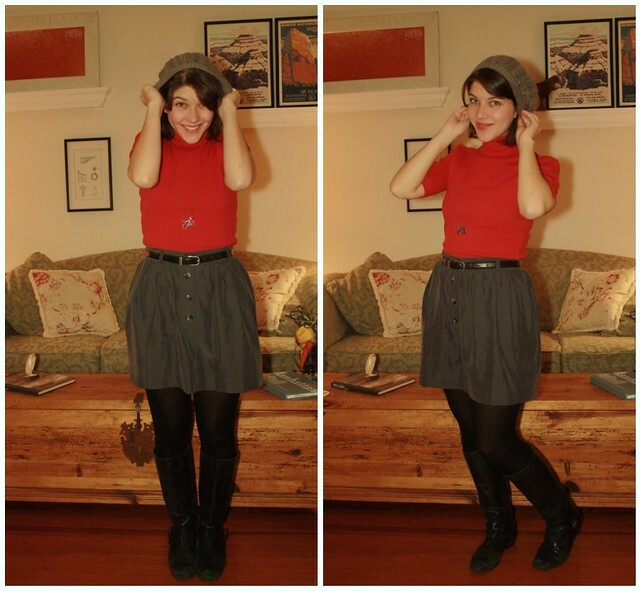 Her bright red sweater and tights were still strolling through my mind and inspired today's outfit. Tonight I'm on the couch with Dracula and an awful sinus infection. Please don't spoil the ending of the movie for me, tomorrow night I'm going to watch the end! Okay, this is getting kinda creepy--I made an inspiration post featuring Une Femme Est une Femme last week! Brainwave twins! I actually went out seeking a red cardigan just like hers to wear both backwards and forwards :D It's missing a button though, and I just haven't had time to fix it. Love your interpretation of the outfit :) The photo of you with the book is so adorable! it is actually very similar, and you look perfect! How lovely! 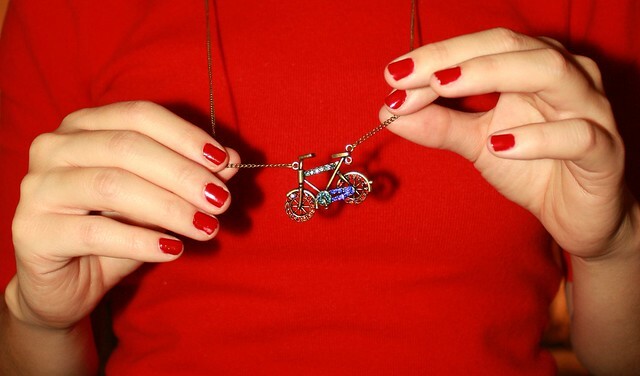 I really want to see that movie now and the little bike necklace is the cutest! i really love that skirt, and i think it's perfect because it looks like the kind that would match just about everything! Ha love the red and hat! You look adorbs! I've never seen the movie but I love the outfit! Red is such a great color & I love how you matched your nails to your sweater. (: I think I might netflix that movie next. Love your red nails + sweater! Sorry about your sinus infection...no bueno! :( Hope you feel better chica! I've actually never seen Dracula. I think I've been living under a rock. The nails, the necklace, the sweater, the skirt.. how is it that everything just looks so perfect together? Aww, I'm sick too...I guess its that time of year. You still look adorable though! oh , love the way you dress yourself, so feminine , i LOVE feminine. Got an article about it on my blog, haha. Stop being so freakin adorable! I kid. I'm too tired to write a real comment, but I want you to know that you are a doll. you look so pretty, and I really like your bicycle necklace, adorable!